In recent years rail roads have been experiencing a boom in order to keep up with increasing demand from shippers. The infrastructures are being upgraded and capacities are increasing due to demand. Struggles this past year at the Southern California Ports, emphasized the need for diversity in a transportation plan. 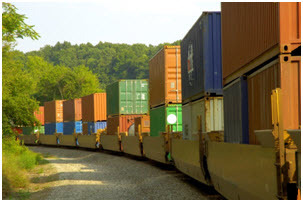 Intermodal transportation offers an important opportunity to lower shipping costs while cutting carbon emissions. Transporting a medium- to long-distance load via intermodal costs 15 to 40 percent less than moving the same load by truck. And studies show that shipping by rail is three to four times more fuel-efficient – and therefore more environmentally friendly – than shipping over the road (OTR). Although transportation managers often shied away from rail in the past, many companies today make Intermodal a key element of their transportation strategies. Over-the-road trucking has had its challenges in recent years, thanks to driver shortages, HOS regulations, rising fuel costs and capacity shortages. During that time, railroads have been improving tracks and facilities, as well as service offerings, to meet shippers’ needs. That has led to a steady increase in the use of intermodal services. Too slow. Unreliable. Risk of damage. These were some of the reasons transportation managers once gave for avoiding rail freight. But many companies are now making intermodal transportation a key element of their freight strategy. Should you?